Every year, as a kick off to Doors Open Hamilton, the Hamilton Burlington Society of Architects (HBSA) holds events during 'Architecture Week'. Last year, On the Cusp with guest Ken Greenberg questioned what needed to happen in the City to realize our city's potential. This year, we're saying, "Enough talk. What can we DO?" Tactical urbanism is a method of working to change a city through short term, low budget actions that generate long term change. The scale of the tactics varies from small to large. The intention, however, is the same. Change the way that people see their City and try to make it a better place. Small tactics include, for example, seed bombing. In this type of project, wild flower seeds are spread in vacant lots or in City right of ways to create an informal urban garden or to simply improve the appearance of a weedy ditch. Larger tactics include Build A Better Block, a tactic that started in Dallas, Texas and involves taking a portion of under utilized street and providing all the amenities that make for a great street. In the Dallas example, a very generous one-way, three-lane road with parking on both sides was converted into a comfortably scaled one-way, two-lane road with a bike lane and cafe seating that took over some of the road allowance. The streets of Hamilton are irrefutably designed primarily for cars. This is a product of several factors, none of which is relevant to where we are today. Today, we know that infinite growth at the edges of cities isn't sustainable - that we're using up prime farm land for housing and that the cores of many cities suffered as people moved to the suburbs. We also know, however, that increasingly, the younger generation in our population recognize the benefits of living in an urban environment. Urban environments increase walkability, which reduces dependency on cars, meaning that typical families can own one instead of two cars. Walking for groceries, restaurants, schools and work reduces our environmental footprint. Cities are also more likely to have arts and cultural events and amenities that attract younger citizens. Finally, from a municipal or city's perspective, increasing density rather than growing at the edges means cheaper development and ongoing maintenance as the sewers and water mains are already in place and new servicing doesn't have to be constructed. I want to see the streets of Hamilton transformed to be more equitably designed for all modes of transportation. I believe that the streets should be places for residents to enjoy, not simply to get from one place to anther. I believe that streets can be places. Finally, I know that the residents that live on the streets often have the best perspective on what a neighbourhood needs. Tactical urbanism is a compelling strategy for working in our city because it allows for the master plans, designed by the city over many years with enormous budgets, to be tested and refined prior to full scale implementation. 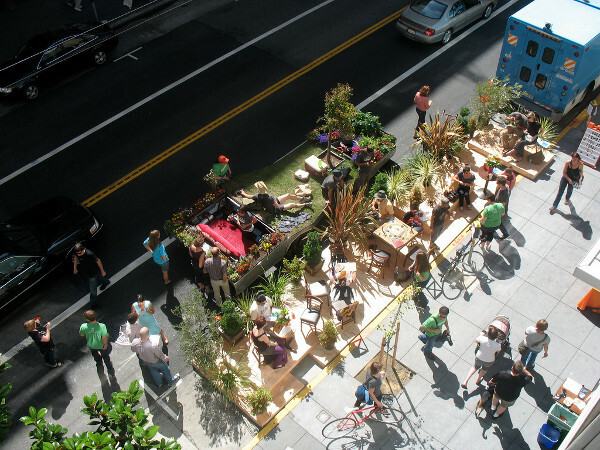 Also, the tactics of tactical urbanism allow a neighbourhood to work together to create something unique to their street building connections between neighbours, local businesses, neighbourhood associations and the City. Two weeks ago, the HBSA invited Mike Lydon, partner in The Streetplan Collaborative to visit and tour Hamilton and, then participate in a design session that focussed on five sites around the City. Teams of five and six people worked for the day to design possible strategies for their chosen site. On May 2, Mike returns to Hamilton to present a free public lecture to launch Doors Open Hamilton. He will describe Tactical Urbanism and show examples from across North America. The schemes developed for Hamilton will also be presented. More info is available on HBSArchitects.com, Hamilton Tactical Urbanism on Facebook, and Hamilton Tactical Urbanism on Flickr. I think "seed bombing" is a cool idea, but if doing it in road allowances be prepared for disappointment. In the minds of City Public Works supervisors there are 3 types of surfaces in the world: Pavement, grass, and "weeds". As an example: the road allowance near the base of the Queen street hill, next to the Boy Scouts office, had been planted with "wild flowers" a.k.a. "weeds" by some community group, don't remember which one, but they had put up a little sign at one end of the planting explaining what had been done. It was very pretty and really added to the space. A City works crew (from the now "well known" Rykman's corners yard, yes they really are that bad) was sent out twice a year with string trimmers to "burn it down" to bare dirt. which they did without complaint, except for me, the second time I was told to do it I quit! I think after 2-3 years of this the plants, and the group looking after them, gave up but I have not checked recently. Seed bombing with invasive species improves your odds. Wtf who voted this up? Invasive species? Really? Milkweed is regarded as an invasive species yet it is vital to the Monarch butterfly. Our civilization is as much dependent on pollinators as it is cheap, GMO corn. Milkweed is often wrongly regarded as a weed, but I have never heard it referred to as an invasive species. Even among the general public, the term is usually understood to refer to non-native species such as garlic mustard and purple loosestrife, that take over ecosystems, crowding out native species (such as milkweed) and creating sterile, unsustainable monocultures. You can see why people might think it's a bad idea. Maybe someone with a sense of humor? Don't forget all our wonderful parks built on top of contaminated lands! ^What's a little toxic waste between friends, eh? a new GO Station at James North is announced, with a mediocre design and parking for 460 cars! Why is Hamilton the Canadian National Champion of dollar stores and money-marts? Why is there no moratorium on parking lot development in the core? Why are the elected councillors so unable to lead? Why is there such an obsessive focus on process, and so little attention paid to content? Why are incompetent bureaucrats so powerful at the HWDSB? If we cannot energize the residents to engage in Election 2014, if we don't dump this mayor and some of the councillors, if we don't stop residents from being treated like cash machines, what is the future? Tactical urbanism may be a compelling idea, but in the Hamilton context it's doomed...like so many really great ideas. Sorry to sound jaded, but the things that go on here are so breath-taking I'll need an oxygen tank soon. The reason is because Hamilton is run like a social service agency not a city. If you are poor you are morally superior. If you are not homeless on welfare or disability then you actually are not welcome in the downtown, you are part of "gentrification". I couldn't find a decent sized downtown condo to purchase when I went looking but if I wanted to rent a low priced bed bug apartment with a crack house in each building, no problem-o. Seriously I grew up in the East End but do not feel welcome in Hamilton anymore. I live out in Oakville and come back once in awhile to visit Denningers, Baltic Bakery, go to the market, go to Millers Shoes. You don't want people like me. Believe me, there's nothing you've written here that I and the other RTH contributors haven't felt and don't feel from time to time. Ultimately, any project of transformation must entail the optimism of hope over experience. All I can say is this: every single thing we citizens try might end up as a failure, but if we try nothing we guarantee that nothing will change. What I got from the TEDx talk embedded in this article is that if you go ahead and just do something instead of perpetually asking for it and it's obviously successful, you may be able to drag otherwise uninspired leaders along for the ride. We have the power, we must only act. The agenda we see at city hall is the result of those who talk and lobbying the politicians and city staff every day. The key to success will be creating a force equal to those out dated group of developers and special interests. The politicians and the staff are not problem, it is our lack organization. "Pittsburgh does have an advantage that Hamilton doesn't — deep-pocketed foundations willing to donate to heritage, said Glen Norton, Hamilton's manager of urban renewal in the city's planning and economic development department. Here, most private contributions go to education or health care." I would like to help do something. Add to your list today's sadly predictable Council debacle leading to spineless non-decison on possible transit funding mechanisms. At this rate we can choose a new motto: Hamilon, where houses are cheap for a reason (or many). Government: 'Here's a list of things we can do to pay for The Big Move. We're gonna have to do something, so figure out which ones are easiest to swallow'. Hamilton: 'Um, no thanks, we don't want any of them. But give us our free LRT'. For more awkwardness, watch Mayor Bratina get schooled by the other GTHA mayors on The Agenda the other week. Thankfully the Chamber of Commerce supports new taxes for LRT. Once again, city hall only cares about re-election. Not the economy, jobs, future or investing in Hamilton. Part of me thinks this is really neat. The other half thinks that this is a symptom of change-averse city compelling architects and urbanists to play dress-up because efforts at substantial change are habitually vetoed by their employers. Agree with Detalumis. My two older brothers, along with families have moved to Cambridge. They are licenced and ticketed tradesmen as I soon will be.My family has always held the work ethic high. My once beloved city has become a place for angry losers pretending the moral highground and manipulating weak clrs. .When my apprenticeship is complete I will be joining my brothers. These moves represent $270,000 gross wages and 11 consumers. Invite more failures to your city with startup money,free rent,food,clothing,spending money etc. In my new city they offer them a bus ticket (hopefully to Hamilton).The city where failure is success and success is leaving. Thanks idiots.